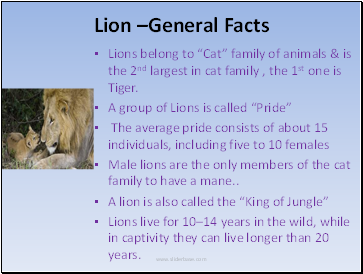 Lions belong to “Cat” family of animals & is the 2nd largest in cat family , the 1st one is Tiger. Lions live for 10–14 years in the wild, while in captivity they can live longer than 20 years. Lions may hunt at any hour, but they typically go after large prey at night. 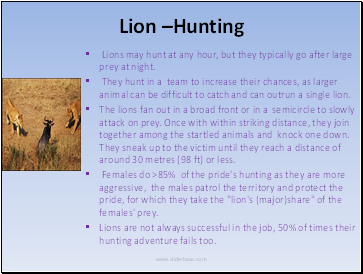 They hunt in a team to increase their chances, as larger animal can be difficult to catch and can outrun a single lion. The lions fan out in a broad front or in a semicircle to slowly attack on prey. Once with within striking distance, they join together among the startled animals and knock one down. They sneak up to the victim until they reach a distance of around 30 metres (98 ft) or less. Females do >85% of the pride's hunting as they are more aggressive, the males patrol the territory and protect the pride, for which they take the "lion's (major)share" of the females' prey. Lions are not always successful in the job, 50% of times their hunting adventure fails too. 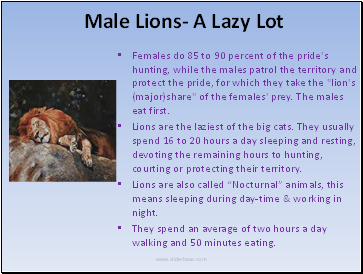 Females do 85 to 90 percent of the pride's hunting, while the males patrol the territory and protect the pride, for which they take the "lion's (major)share" of the females' prey. The males eat first. Lions are the laziest of the big cats. They usually spend 16 to 20 hours a day sleeping and resting, devoting the remaining hours to hunting, courting or protecting their territory. 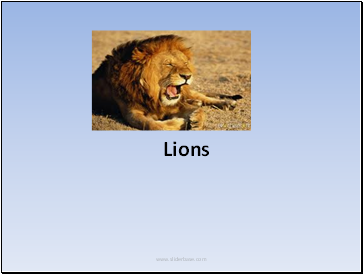 Lions are also called “Nocturnal” animals, this means sleeping during day-time & working in night. They spend an average of two hours a day walking and 50 minutes eating. 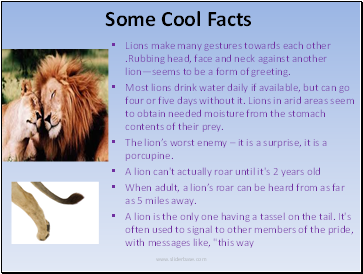 Lions make many gestures towards each other .Rubbing head, face and neck against another lion—seems to be a form of greeting. The lion’s worst enemy – it is a surprise, it is a porcupine. When adult, a lion’s roar can be heard from as far as 5 miles away.